First job was to clear the grass away and level the ground as much as possible to prepare a reasonably flat base to the tunnel. 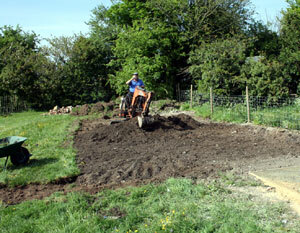 Looked pretty daunting but a neighbour came good and volunteered to help us out with his digger. WOW! … certainly made light work of it. Next we needed a 12″ trench all the way around the perimter ready to bury the edges of the plastic cover. Once again my neighbour came to the rescue and after a couple of hours we had our tenches all dug. Our thanks go out to Arthur! As soon as the site was cleared in went the base posts that would hold the hoops. Worth taking your time to lay them out accurately as any mistakes at this point will come back to haunt you in the latter stages of the construction. A good tip I picked up along the way is to measure the diagonals across each of the sections. 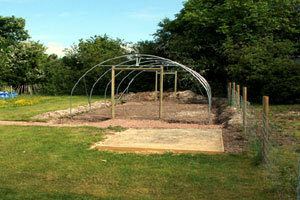 If they are the same then you can be confident your polytunnel will be square. Next the hoops were positioned in the holders, along with the ridge bar, various support bars and the door frames. 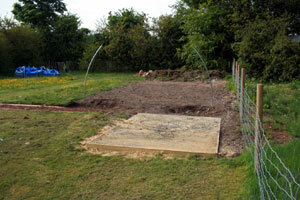 At last it’s starting to really look like a real polytunnel!